All boaters under 16 years of age are required to carry the South Carolina Boating License on board to satisfy state boating regulations while operating on South Carolina's waters. 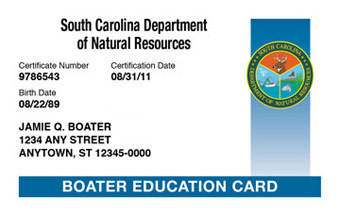 The online South Carolina Boating License satisfies this state requirement. Passing the online exam allows you to obtain the South Carolina Boater Education Card and get out on the water right away! In South Carolina boaters under the age of 16 must complete a boating safety course in order to operate a motorized vessel. Further, an adult must be present on the vessel while anyone under the age of 16 years is operating a vessel, if the vessel has a motor of 15 hp or greater. The same restrictions apply to Personal Watercraft (PWC). All boaters or passengers 12 years of age and younger on the deck or cockpit of any vessel under 16 feet in length must be wearing their PFD while the vessel is underway.